DISCLAIMER: This is very much a work in progress. I am uploading as I finish sections. Please report any bugs you may encounter. While I do my best to test and fix every possible "break" before uploading, there is always the chance that I missed something. I will also gladly take suggestions or recommendations for quests to look at and/or criticism for changes I have made. The goal of this mod is to overhaul the vanilla quests to care about how long you take to complete them. For instance, once you hear about Aventus Aretino you will have two weeks to speak to him before the Dark Brotherhood takes care of their rightful contract and you fail the quest, losing any chance of joining the brotherhood. 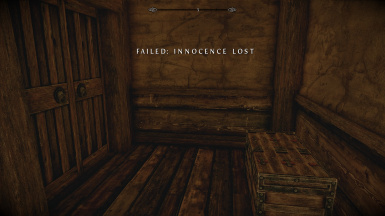 DB01 ("Innocence Lost") will be failed if you do not speak to Aventus or kill Grelod within fourteen (14) game days of hearing about Aventus attempting to contact the Dark Brotherhood. Quest will complete seven (7) days after you kill Grelod, regardless of whether you spoke to Aventus after. You will miss out on the reward if you do not return. Seven (7) game days after DB01 ("Innocence Lost") is completed, the next time you sleep the real dark brotherhood will kidnap you regardless of whether you received the "Mysterious Note" from the courier. If you fail DB01 ("Innocence Lost") or DB02 ("With Friends Like These") you will still be able to complete DB01Misc ("Delayed Burial") later. Cicero re-appears in the Dark Brotherhood sanctuary 7 hours after completion of DB02a ("Sanctuary") to represent travel time from Loreius Farm. Fixed vanilla bug with DB04 ("Whispers in the Dark") which could cause the player to be stuck in the Night Mother's coffin. DBrecurring ("The Dark Brotherhood Forever!") is only repeatable weekly to reflect the responsibilities of the Listener in Oblivion. Brynjolf will not approach you in the market to give you TG00 ("A Chance Arrangement"). He will only come up to you in The Bee and Barb and only if you meet certain conditions (Sneak, Pickpocket, or Lockpicking greater than 25). Speaking to him on your own initiative will still trigger the beginning quest dialogue. Note: Where I make reference to the titles of other mods, I do not refer to using their code, assets, or features, only drawing inspiration for how to proceed. For why I prefer to use my own code, please see my profile's "About Me" section. If you have a suggestion please post it or send me a message. I will always at least consider any suggestion put forward. Time Limit on "Taking Care of Business". Brynjolf will no longer wait forever for you to collect the debts and the quest will be failed if you haven't at least collected on one within the time limit, denying you entry to the Thieves Guild. Ability to select which city the side quest you're taking from Delvin or Vex is in. "Tending the Flames" only available in 4E201 must be completed before Sun's Dusk 4 (this gives the player a little under three game months to join the Bard's College). The burning of King Olaf occurs on Sun's Dusk 5, does not require player attendance. Repeated weekly per the Jarl's decree. If "Tending the Flames" is not completed, The Burning of King Olaf will occur annually, not including 4E201, and the player will be unable to join the Bard's College. Kodlak won't talk to you until you meet the requirements. "Proving Honor" will be failed if you do not meet Farkas at Dustman's Cairn within a set time (TBD). No timer if you travel with Farkas. If "Proving Honor" is failed, you are not kicked out of the Companions but can no longer progress with the storyline. You are, instead, stuck on radiant quests. Time limit on "Joining the Legion". The legion won't wait forever for you to do as you are told to prove yourself worthy. Time limit on "Joining the Stormcloaks". The Stormcloaks won't wait forever for you to do as you are told to prove yourself worthy. Start of Battle of Whiterun will fail both join missions if not attempted or completed. "A Daedra's Best Friend" Barbas will only wait for you for 24 hours before the quest is failed. "The Taste of Death" Quest will be failed if you do not enter the Crypt within a week of hearing of the trouble. If failed by the timer, Eola will be killed by the town guards. "The Heart of Dibella" Time limit on entering the inner sanctum of the temple after hearing about the sisters communing with Dibella. More to come as I continue to research and plan.